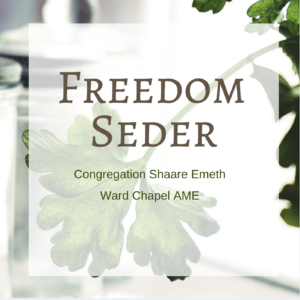 Using a specially crafted Haggadah, we will tell the stories of enslavement and redemption from both the Jewish and African-American perspectives. We will join together in songs of freedom and shaare our dreams for a more just and equitable world. Symbolic food will be tasted throughout the seder, but a full dinner will not be served. Reservations required by Friday, April 18. Questions? Call 314-569-0010 and ask for Debbie Bram. Thank you to the Harvey and Leanne Schneider Interfaith Fund for their help in underwriting this event.